Dental X-rays are an important part of a thorough dental examination. A full set of X-rays are usually required for new patients or patients that need extensive treatment. Two to four follow-up or check-up X-rays are necessary every 6-18 months, depending on your needs. Dental X-rays are needed because they expose hidden dental decay; reveal dental abscess, cyst or tumor; show impacted or extra teeth; and also help determine the condition of fillings, crowns, bridges and root canals. Dental X-rays can also reveal bone loss from gum disease, locate tartar buildup, find foreign bodies within the gum or bone, and see if there is enough bone for the placement of dental implants. These are just some of the many reasons why we rely on dental X-rays. Some people get worried about the exposure to radiation during dental X-ray procedures. This is very understandable in light of the relatively high radiation of some medical X-rays. We are very concerned about minimizing the amount of radiation a patient receives at our office. That’s why we use Digital X-rays, and cover every patient with a lead apron during X-ray procedures. Digital X-rays are both safe and effective, and can be used during pregnancy. The benefits of using this new technology are an 80 percent reduction in radiation and no need to develop film. The process produces images nearly instantaneously, and the ability to use color contrast in the image. 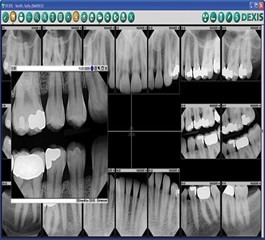 Dental X-rays are an important tool in the diagnosis and treatment of dental problems. However, they do not replace visual examination of the oral cavity. The combination of both the X-ray and the visual examination helps us determine the best treat for the patient.